This evening at this dinner we were invited to come taste over 600 years of winemaking history with MASI Serego Alighieri. Six wines from this historic estate were paired with a menu from chef Josh Gonneau of Cibo Trattoria, bringing a taste of Valpolicella to Vancouver. Cibo Trattoria is located downtown on Seymour Street, and is a small cozy restaurant. 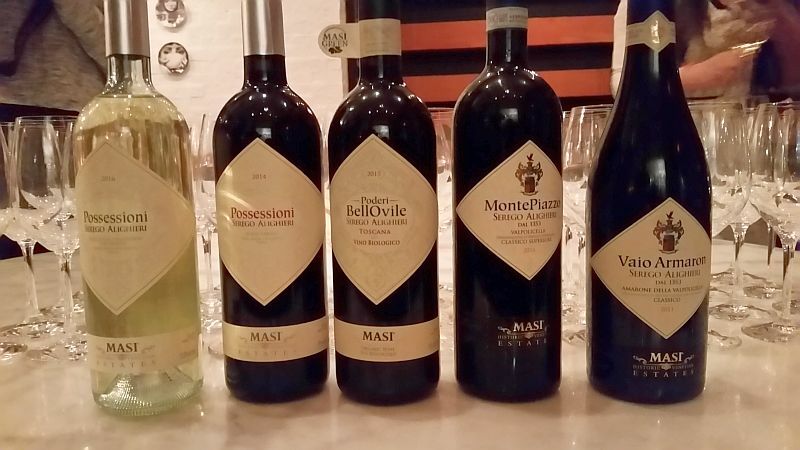 Mr. Luc Desroches, Sales Managing Director Americas from MASI Agricola led us through this tasting. He began providing us with some background on Serego Alighieri. It all began we are told in 1353 when Dante’s son, Pietro Alighieri acquired the Casal dei Ronchi vineyard in the Valpolicella Classica region. Twenty-one generations of Dante’s descendants have lived on the estate. The winery is known for the use of the Molinara grape (they have a specific clone) and Corvina grapes, and the use of cherry wood casks for aging their red wines. The Possessioni Biano 2016 is a nice house white wine to enjoy. It is a blend of 85% Garganega and 15% Sauvignon Blanc grapes. We were told that the Garganega grape gives the structure to this wine, while the Sauvignon Blanc is to add extra flavour. This wine is light and dry with citrus and honey on the nose, and light citrus flavour. 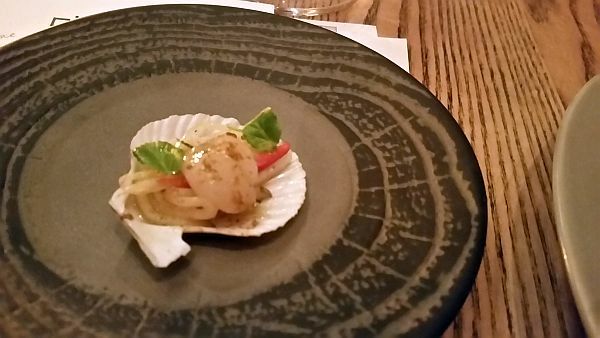 The Scallop Crudo was excellent with the fennel flavour matching nicely with the wine’s flavour. The Possessioni Rosso 2014 is a red blend, primarily Corvina (70%), but also has 20% Molinara, and 10% Sangiovese grapes. As you may know, the Sangiovese grape is the primary red grape of Tuscany, but the Alighieri family uses some of this grape in Valpolicella, which is quite unique. This wine has a smoky, red fruit nose. It is medium bodied, dry, angular, with more smoky, red fruit on the palate. 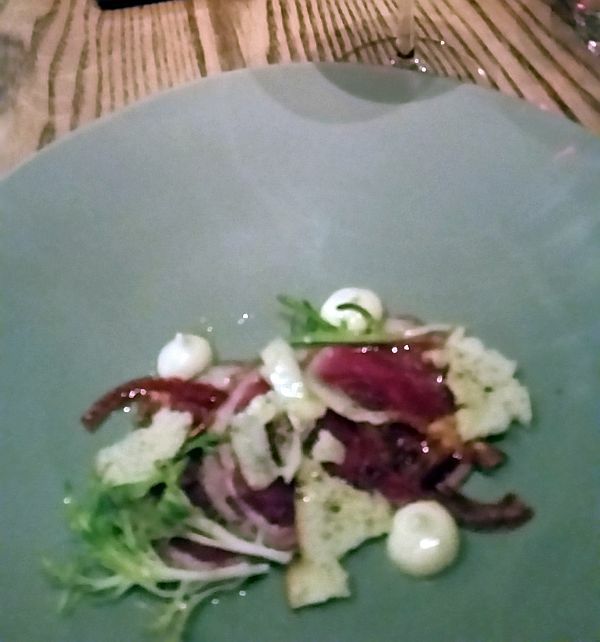 The Alberta Lamb Carpaccio was soft and I enjoyed the dried tomato for its sweetness and the bite from the asiago cheese. This was a complimentary pairing to the wine. Next was the Poderi BellOvile Toscana IGT 2015. This wine is a blend of Sangiovese, Canaiolo, and Ciliegiolo grapes. It has a lightly smoky, bramble, dark fruit nose. Fuller bodied, dry with fine tannins. A mix of bright red fruits, and tart red fruits. A very nice wine. 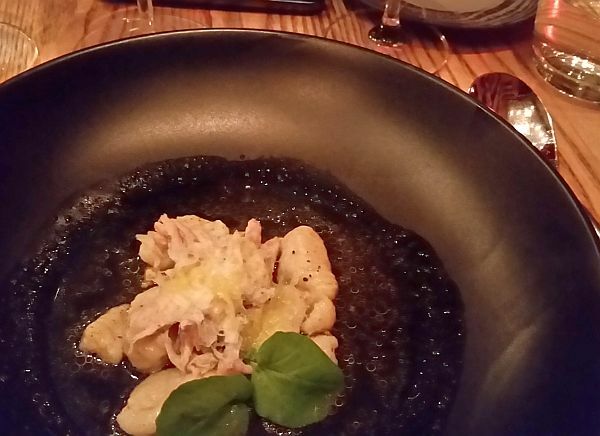 The Gnocchi was a lightly flavoured dish with the braised rabbit and rabbit brodo (broth). To me, it had a burned butter flavour, some fattiness and earthiness. The wine’s bright red fruit flavours balanced the earthy flavours of the gnocchi. The MontePiazzo 2014 is a Ripasso style wine, where the grapes are partially dried before pressing and fermentation. In this case, the grapes are picked in September then dried for 2 months. For Amarone, grapes are dried for 4 months. This wine is a blend of Corvina, Rondinella, and Molinara grapes. This wine has a dusty, cherry and dark fruit nose. Fuller bodied, dry with some sweetness coming from the dried grapes. The wine has a mix of cherry, oak, and sweet spice flavours, and finishes with some pepperiness. The Slow Roasted Pork Belly was my favourite dish and pairing. I enjoyed the creaminess of the polenta with the smokiness of the pork belly. The pork belly also had nice nutmeg spice on the crust. In addition, adding the sweetness of the tomato relish really made this dish pop. The wine pairing was complimentary. 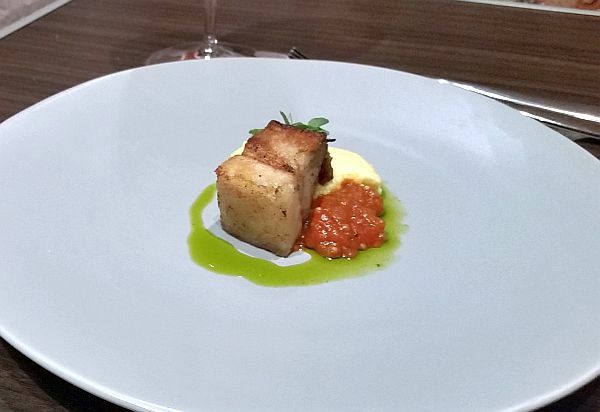 The acidity in the wine and cherry flavour went well with the pork belly, the nutmeg spice and the tomato relish. The Vaio Armaron Amarone DOCG 2011 we were told is listed as one of the top 10 wines in the world according to Wine Spectator. The grapes come from the Vaio Armaron vineyard. The wine is a blend of Corvina, Rondinella and Molinara grapes. It showed sweet ripe red fruits and cherries on the nose. It is fuller bodied, round, off-dry. Fuller mouthfeel with flavours of red cherries, black fruit, and some pepperiness. Firmer tannins on the finish. The Pan Roasted Beef Striploin was soft, done medium well, and showed rich fattiness. 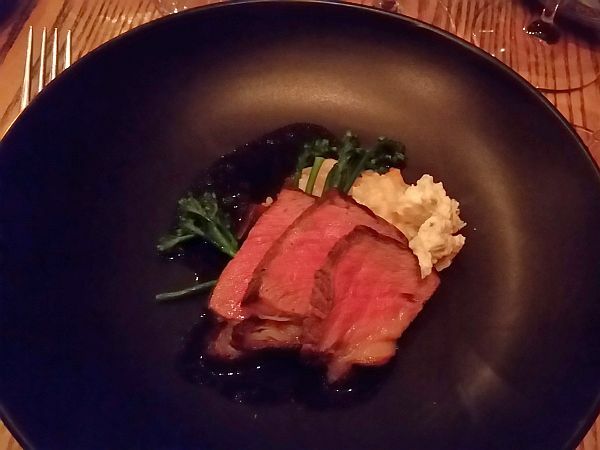 I enjoyed the play of the fattiness of the beef with the sweet component of the wine. A rich beef dish paired with a richly flavoured red wine. Very nice. 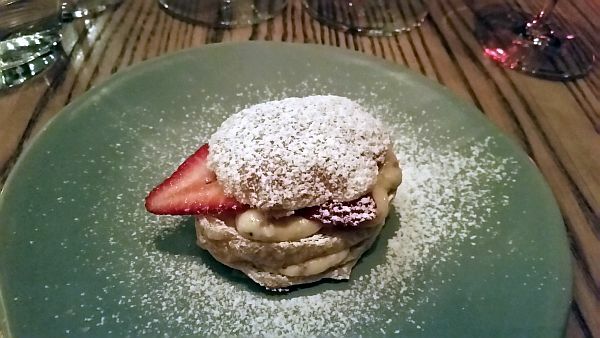 The mille-feuille was a nice dish on its own with primarily almond flavour to me. The slices of strawberry did not add much flavour in my opinion. Tasting the wine with the mille-feuille did not enhance either one. But both on their own were enjoyable. Thank you to Cibo Trattoria for preparing these wonderful dishes, to Serego Alighieri for providing these wines, and to the Vancouver International Wine Festival for inviting me to this dinner.